By Becky Bowers on Friday, May 10th, 2013 at 4:06 p.m.
Dead Americans, a botched rescue and a political coverup — that’s the story Republican lawmakers told this week as the nation heard riveting testimony from a diplomat who was in Libya the night of Sept. 11, 2012, attacks. If your reaction to "Benghazi" is — "What?" — here’s the short, official version: Diplomatic workers staffed a temporary residential outpost in the Libyan city after the death of dictator Moammar Gadhafi. On a night the U.S. ambassador was visiting from the capital in Tripoli, armed Islamic terrorists attacked, setting a toxic diesel-fueled fire that killed the ambassador and a colleague. Americans then drove, chased by attackers, to a nearby annex, where a mortar attack in the morning killed two security contractors. By noon, hasty scrambling by the American and Libyan governments got U.S. workers to safety in Tripoli, along with their four dead comrades. There are lots and lots of unofficial versions. And there’s one big complicating factor: that "annex" was a compound used by the CIA. So, while we’ve seen unclassified reports from a State Department accountability review board, a Senate committee and some House Republicans, and watched testimony before Rep. Darrell Issa’s House committee this week — there’s a layer of secrecy that daunts diplomats and lawmakers alike. Gregory Hicks — who became the top-ranking diplomat in Libya the night ambassador Chris Stevens died — told the dramatic story Wednesday of his work to coordinate a rescue. But even he’s not had access to the review board’s classified report. Still, lawmakers are busy stretching what’s known into pointed political attacks. As evidence is still emerging (and in some cases, classified), we won’t rate these on our Truth-O-Meter for now. Rep. Jason Chaffetz told Fox News that armed Americans ready to fly in to "help their fellow countrymen who were dying and being killed and under attack" were told not to go. But the armed men Chaffetz described, according to Wednesday’s testimony from Hicks, would have been part of a recovery mission after four Americans were already dead. Issa and Sens. Lindsey Graham and John McCain charged that the administration told a cover story in the days after the attack to protect President Barack Obama’s presidential campaign. "If the truth had come out seven weeks before an election this was an al Qaida-inspired pre-planned attack, it would undercut the narrative … politically that bin Laden's dead, we're all safer," Graham told Fox News. "Political manipulation is rampant here." Evidence is now emerging that inaccurate talking points were heavily edited — then used, most infamously, by U.N. Ambassador Susan Rice. But neither those email messages nor testimony Wednesday traced a direct connection to the presidential campaign. Back then, Rice said, "We do not have information at present that leads us to conclude that this was premeditated or preplanned," and that attacks began "spontaneously ... as a reaction to what had transpired some hours earlier in Cairo." It’s true that neighboring Egypt had suffered protests to an anti-Islamic video. But Hicks testified there wasn’t evidence of either a protest or reaction to the video in Libya. Hicks, who said that Rice’s description of events on Sunday talk shows after the attacks left him "stunned" and "embarrassed," told lawmakers he didn’t know why she said what she said. "Perhaps you should ask Ambassador Rice," he told them. We may not ever know exactly what happened that night in Libya. 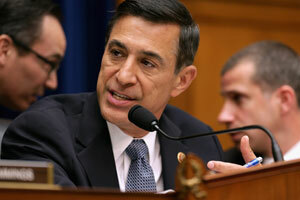 Issa concluded hearings Wednesday saying, "this investigation is not over." We’ll be monitoring for claims to check.